The Lake Darner is currently ranked S3S4 as a "potential species of concern" in Montana because it is potentially at risk of extirpation in the state due to limited and/or declining numbers, range and/or habitat, even though it may be abundant in some areas. The Lake Darner is a member of the family Aeshnidae. Darners are among the largest and fastest-flying North American dragonflies, 2 1/4-4 3/4" long. These brilliant blue, green, or brown insects have large, clear wings spanning up to 5 7/8". Their compound eyes meet on top of the head. The female hovers above water usually attached or guarded by the male and, using a well-developed ovipositor for slicing into emergent plants, thrusts eggs one at a time in the stems. Preferred habitat is sparsely vegetated or woody lakes and ponds, as well as marshes, fens, bogs and slow-flowing streams. Wetland systems: Western Emergent Marsh, Northern Rocky Mountain Wooded Vernal Pool and the Rocky Mountain Subalpine-Montane Fen. Lake Darners prefer sparsely vegetated or woody lakes and ponds, as well as marshes, fens, bogs and slow-flowing streams. They feed at forest openings and will perch on trees, branches and sometimes on the ground (Dunkle 2000, Paulson 2009). Larvae feed on a wide variety of aquatic insects, such as mosquito larvae, other aquatic fly larvae, mayfly larvae, and freshwater shrimp. They will also eat very small fish and tadpoles. Adult- The dragonfly will eat almost any soft-bodied flying insect including mosquitoes, flies, small moths, mayflies, and flying ants or termites. Male Lake Darners are not territorial and fly over open water or along shorelines, usually staying out of vegetation except when to search for females. They do not hover like most other Darners and will fly continually all day long investigating anything near the water. Females oviposit on floating logs, in stems of emergent herbacous vegetation, and in root tangles at or just below the waterline (Dunkle 2000, Paulson 2009). 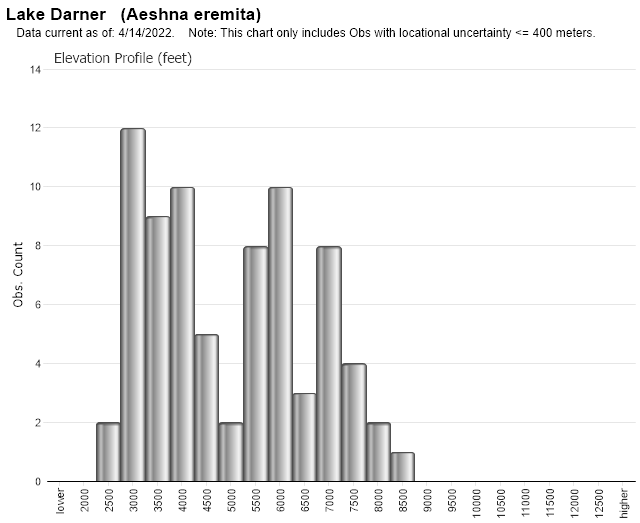 Kohler, Nathan S. Excel spreadsheets of Odonate observations/collections in Montana. Miller, K.B. and D.L. Gustafson. 1996. 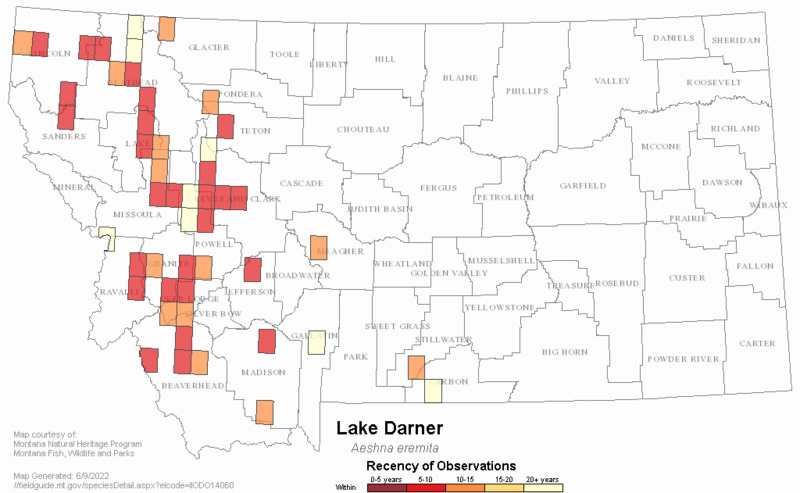 Distribution records of the Odonata of Montana. Bulletin of American Odonatology 3(4):75-88. Dunkle, S.W. 2000. Dragonflies through binoculars: A field guide to dragonflies of North America. New York, NY. Oxford University Press. 266 pp. Paulson, D.R. 2009. Dragonflies and Damselflies of the West. Princeton University Press, Princeton. 535 pp. Web Search Engines for Articles on "Lake Darner"